Multi channel customer support provides several options to customers on how they would like to communicate with a brand for any kind of assistance. It is the combination of several support tools like traditional phone calls, email, live chat, help-desk and social media. Customer support is not the ‘one size fits all’ solution. Different people like different methods to communicate. Being an online business owner, you have to understand this first. 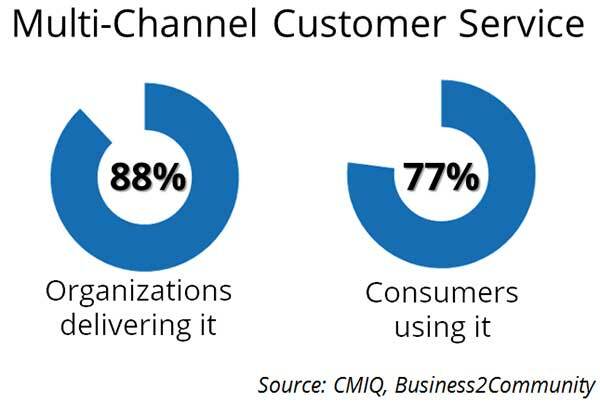 Always assist customers in the same way they want and omni-channel customer support approach makes it possible. But before going for this kind of service, few important things should be kept in mind. Let’s discuss. Which support channels to choose? It’s simple: channels your consumers would like to use. Don’t forget that your customers are important and they will be happy only if you provide support to them in the same way they want. To know their preferred channels, you can run customer surveys and get ideas from them. Certain customer support channels like phone, email, and social media are being used by most of the companies now days. It means the whole customer support experience should be smooth. If it’s required to shift from one channel to another, then the system should be able to pick up the conversation threads without any obstacle. All details and conversation history should be documented properly so that the support agent don’t get confused and ask the customer to repeat his concern after the switching, for example from self-service to live chat or live chat to phone call. Here any information given to customers must be correct and match properly irrespective of all the channels. If it does not happen, then there is no point of consolidating all the channels together. Use a common workflow process and knowledge bases to provide accurate information. If customers find any inconsistency, then chances are that they may doubt on your customer support quality and think that your company as a whole is disorganized. It’s true that you should offer all the favorite channels of customers but there is no point if you can’t handle those efficiently. You need enough man power and tools to handle this kind of support system and if you need time, don’t start offering all the channels together. For example, email and live chat support are much easier to handle. So, initially you can start with those only. Compared to these two, phone support is much more complex as it requires huge manpower to handle call volume and dedicated IVR system. Take some time out to review call recordings, emails, social media messages and chat history from customers to understand the quality of your overall support service and what is coming up from the customers. You should try to find out the mostly used channels and common flaws. If customers discuss about the problems associated with any of your support channels, work harder to solve those issues ASAP. Let all the agents of your support team switch between different channels from time to time. Supporting customers through only one channel will become monotonous for the team and gradually they will be tired and loose the enthusiasm. For example, if one agent constantly provides support over phone, the monotony of doing the same job will harm his effectiveness. On the other hand, if he switches between different channels after a certain time, he will learn to provide support in multiple ways, at the same time will be more flexible and efficient. Your omni-channel customer support strategy should focus on providing exceptional experiences to customers. Offering such experience is not that easy as it requires time and investment in certain areas. So, before start, understand it thoroughly.